Les at classic dastun is the official supplier of the 'right' blue for the block and the 'right' grey for the tail lit finisher/grill/ hub caps. Classic Datsun Motorsports. Suitable 'close enough' substitutes have been discussed here several times. Search for 'duplicolor' along with hub caps or tail light panel or finisher. I dont know what the code is, but you can order it at Banzai Motorworks and the shipping bla bla. Dont know the colour code, but I read that Banzai it pretty close to original as it gets. Would it work if I take a picture of the right color on the engine block to a paint shop and let them decide as close to possible? Just found this on Zcar? The Number is Pontiac Blue DE1610. The Pontiac color is close, but not exact. If you want to get fussy, the paints from CDM or Banzai are the right stuff. I know your posting about engine paint colors here but, for what it is worth, my ... errr ... I mean YOUR 240Z is painted in a Subaru color --- from about 2004 as I recall! Alan V.
Yeah, I really like that color and will keep it that way Alan. Just that iˊd like to bring the engine and bay back to orginal look.. Some enthusiast here have taken the block to the paint shop and let them figure out proper color. There was no code available on record here in Australia - I asked around. 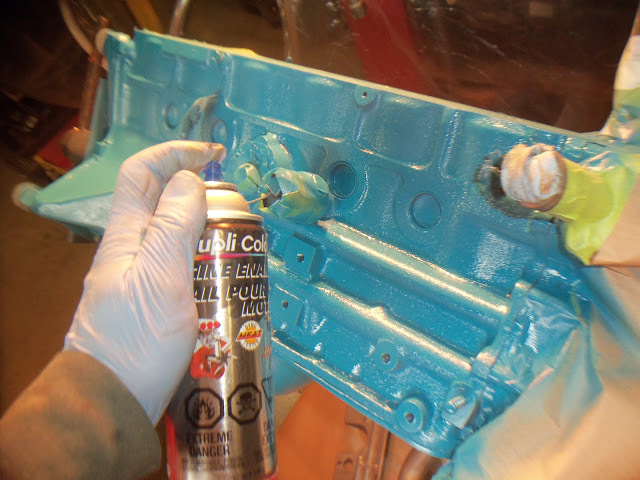 So when restoring my engine, I took the alternator bracket down to a place that supplied the panel beaters paint. We then spent an hour out back mixing the colour I needed to get what appeared to be an exact match. They then put it into spray cans and I painted the necessary parts. They kept the mix on record so now I can go get the paint anytime. Did the same for the orange on the air cleaner. I was quite particular and you cannot tell the difference. Bart, If you find a local supplier that can fill spray packs. PM me. To mix one can would cost a lot. Maybe we can bulk buy and get a discount? Im in the same boat as you. All that shipping and taxes its getting ridiculous. At this rate ill spend €5000 on restoring and €10,000 on shipping and taxes. If you have a piece that contains the original color let me know, I will take it to the paint shop to examine the color. We can bulk, but I only need 2 cans or so..
Do you guys ever use the SEARCH function? We've discussed all this many times before. The original colour had its roots in the Austin-Nissan tie up of the 1950s. The colour is still listed on the 'British Standard' database as B.S. 18C39, with HMG ( Her Majesty's Government ) Glidden number GL31557, and Glidden number name 'Dolphin Blue'. I think a Netherlands-based paint supplier should be able to cross-reference those codes. So I need to give them BS18C39, correct? The website says "The colours depicted are also for guidance only. The displayed colour will depend on your monitor and browser" I hope so, it looks a lot darker than what my engine is painted. I will let them make a rattle can, and spray it on to my engine, see what it does. This must be the right color then. Do you guys ever use the SEARCH function? We've discussed all this many times before. The original colour had its roots in the Austin-Nissan tie up of the 1950s. Worst way to start a reply! I use the search first all the time and RARELY get the answer I seek. Today I searched Engine Color, Block Paint and Engine Paint and I got this thread - and a few others. At least after you "made your point" you - ironically - gave us the information we needed. Thanks. Worst way to start a reply! Not at all. I think it was perfectly valid. It's something we have discussed many times in the past. You managed to find this thread a couple of months after the last reply, didn't you? At least after you "made your point" you - ironically - gave us the information we needed. Thanks. Nothing 'ironic' about it at all. If I have the answer I'll usually give it. Stop complaining. Well I took the code HS30-H gave me to various paints shops, but strangly they couldn't convert the paint code.. so the only will be ordering from the states this summer then. I can't paint the block now anyhow, need to do in the summer months. Well I took the code HS30-H gave me to various paints shops, but strangly they couldn't convert the paint code. I don't know why not. My local automotive paint supplier can cross-match across BS, Glidden and RAL ( the European Standard ) paint codes, as well as custom mix and match to sample.